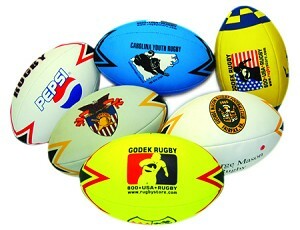 A great rugby status symbol, your own custom printed rugby balls! Made of top grade materials and in any size from mini to match quality size 5s. These are popular, unusual and always a big hit. We have done these for beverage companies, banks and law firms for promotional purposes as well as clubs, colleges, universities and tournaments across the country as their match and practice balls. We invite you to use our star pattern in your own team colors, add your logo, and maybe that of your sponsor too. Also we offer you the chance to design your own rugby balls. You are limited only by your imagination. Minimum order of 30 balls. Allow 4-5 weeks from final art approval for delivery.